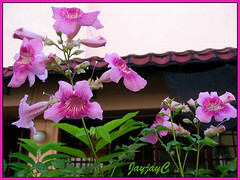 A gorgeous vine or shrub that is decorated with trusses of attractive pink trumpet-shaped flowers all year round in warmer tropics, and from late summer to fall in colder regions. 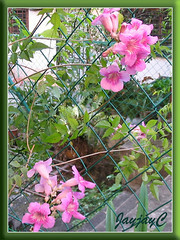 Plant type: Perennial or tender vine, native to South America (? ), but introduced and naturalized in Southern Africa at Port St Johns by slave traders in the 1600’s or before, and widely cultivated in the Mediterranean countries, California, Florida, Australia and Asia, even Europe. Features: Podranea ricasoliana is one of the 2 species (the other is Podranea brycei or the Zimbabwe Creeper) of the genus, Podranea which belongs to the Bignonia family of about 109 genera. Like the Allamanda cathartica, it is a vigorous woody vine without tendrils, yet can climb to more than 10 m tall in the wild, though in cultivation it is usually maintained at about half or less that height by regular hard pruning. A fast-growing scrambler that spreads about equal or greater than its height. It produces tall thin stems with long, spreading and arching branches that are covered with evergreen and glossy green foliage with pinnate leaves that have 5-11 opposite leaflets that are ovate with tapered tips. Stems that trail on the ground root easily and can be severed to propagate new plants. Held above the foliage at the branch tips of new growth are the showy trusses of bell-shaped flowers in sweet pink with deeper pink veins and light yellow blotches in their throats. 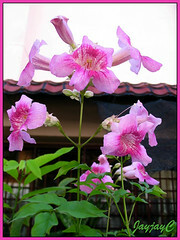 Flowers are large and each flower is about 4-6cm across. It produces long narrow and flattened seed pods containing many brown seeds that are ovate and flat in papery wings and will split open when fully ripe to self-sow readily. It is listed as an invasive plant in Queensland and New South Wales in Australia and in New Zealand because of its tendency to coppice vigorously from prunings. Culture (Care): P. ricasoliana can be easily grown with little attention. Light: Full sun to light shade, but grows and flowers best in full sun and heat. Moisture: Medium water requirements but plenty in very hot climate. It is moderately tolerant of drought once established. Soil: Fairly moist, fertile and well-drained soil. Others: Prune regularly after flowering to control size or maintain a shrubby bush appearance or even to encourage flowering. It can take hard pruning. If grown as a vine, its branches and stems need staking for support. Feed fortnightly with a water soluble fertilizer at half-strength. No serious pests or diseases, though occasionally bothered by stinkbugs, dahlia bugs and aphids. For temperate regions: Hardiness: USDA Zone 9a-10b. Though it can tolerate light frost, best to protect its roots by mulching. Should it die during frost, it returns easily in spring or in warmer climate. Depending on the climatic conditions, foliage can be semi-deciduous to deciduous and flowers bloom in late summer and fall. Prune in winter or early spring. Propagation: Easily by seeds, semi-hardwood/hardwood stem cuttings or layering. Even low-growing stems that have rooted by themselves when in contact with soil, can be removed to start new plants. In the warmer tropics, propagation can be done anytime but in cooler climates, seed should be sown in spring or during summer, as with cuttings and layering. Usage: Excellent as a showy flowering shrub for hedges and screens, especially over chain-link fences or espaliered on a wall or cascade down a garden wall. Ideal to be trained as a climber with support at porches and on trellis, arbors and trees. Suitable for xeriscaping or as a ground cover or for a coastal garden as it is tolerant of sea spray. It can be grown in a large container as an ornamental specimen outdoors or overwintering indoors in freezing climate and for greenhouses. Loropetalum chinense var. rubrum ‘Burgundy’ is sizzling pink!